Using the work of Imam al-Ghazali, Shaykh Faraz Rabbani presents this course on the adab of Qur’anic recitation. In the first part, he explains the definition of the Qur’an as the speech of Allah, and highlights the reality that those reading it enter into the divine presence as receivers of a divine address. Consequently, they should display the utmost etiquette while reciting. This etiquette has an inward aspect that is expressed outwardly. Shaykh Faraz discusses these outward and inward manners in parts two and three respectively. He concludes by considering several keys and practical tips to bringing the Qur’an into our lives. As Divine speech, the Qur’an leads people from darkness to the one true light. It is guidance for the people of piety to the straight path that leads to Allah. Pious people hold fast to the Qur’an, and have the correct inner and outer manners of relating to the Qur’an. Shaykh Faraz discusses ten outward manners, such as ritual purity when reciting; consistency in the amount read each day; striving to read one juz a day; accurate tajwid; and supplication in the recitation. He also explains ten inward manners that generate the outward ones, including slow and reflective recitation; understanding the deeper meanings of the Qur’an; removing the veils that prevent us from understanding it; rising in the degrees of excellence in recitation, which culminates in putting Allah first and oneself last; and recitation in the knowledge that there is no might or ability except with Allah. 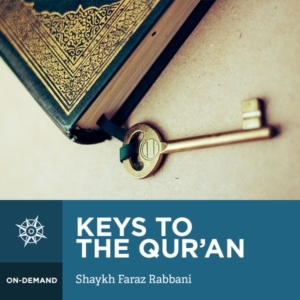 The keys to living the Qur’an in these ways include recognising how deeply one needs Allah’s guidance; seeking to emulate those who have been rightly guided; and ensuring that one has the certitude in faith that flows from beneficial knowledge.